I turned around angrily and grabbed the police officer’s arm, almost twisting it. There was no need to push me through that huge iron door into the cage, but he did anyway. He pushed so hard that I stumbled. I was so enraged that I couldn’t speak. I glared at him in silence. His face was expressionless – like stone. I was a defendant and he was free to abuse me. We stood like that for almost a minute until another officer helped to push me inside. The sound of the cage door slamming shut in my face woke me up to reality. I closed my eyes for a few moments then opened them again. I was still in the cage. I turned around and saw 14 others, including three young women in their 20s. They all seemed to know one another, and were standing in groups of twos and threes. Some continued to whisper. Others fell silent. In the media frenzy before the trial, they’d heard that a well-known journalist had been included in the indictment at the last minute. They’d been waiting to find out who that journalist was. After 20 years as a war correspondent covering conflicts in Serbia, Afghanistan and the Democratic Republic of Congo (DRC), I was no stranger to detentions, arrests and even imprisonment – all punishments for telling the truth. I’d been kept in solitary confinement in a Kabul jail by the Taliban and in a DRC prison so bad that it made me long for my cell in Afghanistan. Then there were the three days in July 1991 when I was held in the woods, my hands tied behind my back, by Serb forces during the Serbo-Croatian war. 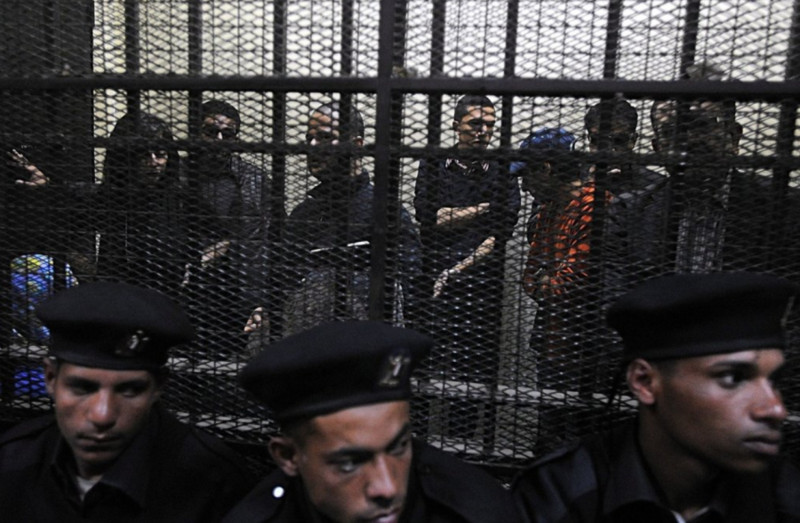 But I couldn’t recall ever feeling as estranged as I did standing there inside that cramped cage in the criminal court building in Al-Qahira Al Jadida, a suburb east of the Egyptian capital of Cairo. From my first moment inside the cage I felt like a foreigner in my own country. I didn’t even know what crime I was on trial for until the trial began. There had been plenty of talk in the media, of course, with officials throwing around accusations that sounded more like stories from the realm of science-fiction than law. After the first hearing, I learned that my charge was, in fact, accepting funds from the US to train journalists. The only element of truth to that was that I’d intended to be an adviser to a journalism training programme. But I’d been taken in before the programme began and I’d never received, nor was I supposed to receive, foreign funding. As a newspaper editor, I had never imagined that the military might indict me simply for agreeing to teach journalism students. In fact, I might even have expected a thanks. But there was another reason why I felt like a foreigner: there was no difference between my country’s military regime and the developing world dictatorships I’d covered throughout my career. Suddenly, I felt as foreign as I had when detained in prisons overseas. The cage was suffocating; so small that I could feel the breath of the other detainees on my face and the back of my neck. I didn’t want to talk to anyone, so I made my way through the bodies to the corner, only to stumble into a man sitting cross-legged on the rough cement floor. “Sorry, could I get to the corner?” I asked in Arabic. The man looked up through the thick cigarette smoke that surrounded him and gestured a typically Egyptian sign for welcome. But he wasn’t Egyptian. He was American. I was confused because I’d heard that all of the American defendants had taken refuge in their embassy in downtown Cairo, and that the US had declared that its citizens would never stand trial on politically motivated charges. I was equally as confused because the American seemed to have understood my Arabic. I passed him and stood gazing through the iron bars of the cage, which ran from floor to ceiling and opened to the vast courtroom. An audience had gathered: a strange mix, the majority of whom had nothing to do with our case. I later discovered that the authorities pay people to attend those cases that involve the media or are deemed to be of high political importance. But alongside our rent-a-baying crowd were family members of my co-defendants, civil lawyers who represented the “public”, the defendants’ lawyers, uniformed and plain-clothed security personnel and, most importantly, other members of the media profession. As I stared at the crowd, the quiet ramblings of the paid audience turned to shouts. “Death to the traitors,” they demanded. “Death?” I asked, first silently, then aloud. At those words, I smiled – for the first time in the weeks since my ordeal had begun. It was the beginning of a life-changing conversation that hasn’t really stopped in the five years since. “What state are you from?” I asked him. It dawned on me then that many of my own friends, some of whom I’d come to view as brothers and sisters over the years, had either betrayed or abandoned me. Despite knowing that the whole thing was a farce, many had chosen to attack me – using their newspaper columns and television shows to do so, either because they knew it would please the military or because they saw in it an opportunity to take out someone they considered a professional threat. I looked at my American cage mate, who reminded me of a modern-day John Wayne. “Excuse me, are you for real?” I asked. I reached out to shake hands with him, and we burst into laughter. We laughed so loud that it attracted the attention of those audience members sat closest to the cage. They responded by calling us names and labeling us agents of the US. My new American friend, Robert Becker, asked me what all the shouting was about. I explained that they were accusing him of things that might result in him receiving a life sentence, but which, if proven against me, could well lead to death.